Will the Driver Responsible for Your Crash Go to Jail? Tired driver are dangerous—period. However, while the average commuter may only be a threat to himself and the few cars around him, a sleepy bus driver threatens the safety of his many passengers and every motorist he passes. What bus drivers need is obvious: sleep. So what is preventing them from getting the shut-eye they need to drive alert? Low level of physical fitness. Economic demands due to low pay. Multitasking while driving—taking tickets and talking to passengers. Lack of adequate sleeping options on the bus. Lack of sleeping quarters on the bus. 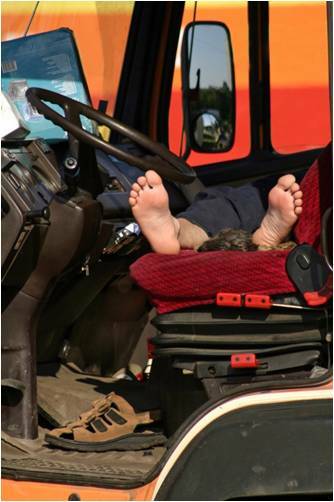 The FMCSA sites the lack of comfortable sleeper-berth areas for drivers. Such an area could be used when drivers have a break, and would allow them to get the rest and sleep they need. The FMCSA states that if hotel rooms, or even fully reclining driver's seats, were made available, drivers would be able to get the sleep they need. Low driver pay. Bus drivers aren't paid terribly well, so they often take on more work than they should. This leaves them tired, stressed and more likely to get behind the wheel while fatigued. In addition, tour bus drivers rely heavily on tips to supplement their income, so they may take on "off-the-book" trips to make more money. The only way to fix this is to pay drivers better, and this is not likely to happen. Off-duty loopholes. Drivers may have to work longer than allowed by law when traffic or road construction slows their trips. While bus drivers are supposed to get eight hours off for every 10 hours driving or 15 hours on-duty, this rule is often broken. The study suggests that off-duty rules should change so that drivers are allowed 10 hours off-duty after long shifts. As Vancouver attorneys who often work with bus accident victims, we would like to see all of the above recommendations followed. After all, a bus driver is responsible for many lives each time they get behind the wheel. If you would like to learn more about bus safety and our efforts to protect the rights of those hurt during a bus accident in BC, follow us on Twitter or read our bus accident blog.